Why be too showy? Style can be found in understatement. 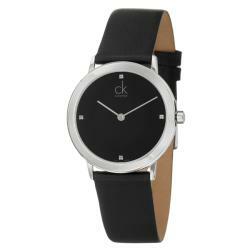 This stylish men's 'Minimal' watch from Calvin Klein features a stainless steel case with a coordinating black leather strap. The black dial sets the stage for silvertone hands and diamond hourly indices.